The Department of Training and Workforce Development’s Migration Services is pleased to advise that a new Graduate stream is now available for Western Australian State Nomination through the State Nomination Migration Program. 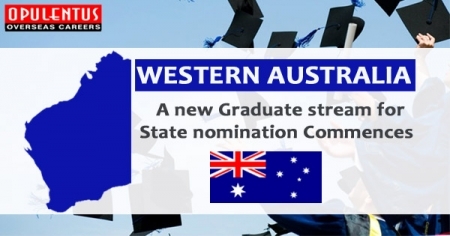 • Can meet the Western Australian State Nomination Graduate stream eligibility criteria. As from October 2018 it is anticipated invitations for Western Australian State Nomination will be issued on the second Thursday of each month. The new Graduate Occupation List will provide a viable pathway to skilled Immigration for the best and brightest university graduates in an effort to increase the State's share of the international education market. We are committed to developing and investing in an International Education Strategy to grow and diversify the knowledge economy, while creating jobs for Western Australians. New list will provide a pathway to skilled migration for Western Australia's best and brightest international graduates. The initiative will attract the best global talent to boost the economy and create jobs for Western Australians The best and brightest international graduates from Western Australian universities can now submit an expression of interest under the McGowan Government's new Graduate Occupation List. Candidates who wish to be considered for State nomination under the graduate stream of the SNMP will need to submit an expression of interest using the Federal Department of Home Affairs' Skill Select database. Best and brightest graduates will be invited to apply each month. It is expected the new Graduate Occupation List will attract an increased number of high quality international graduates with PhD, Masters, Honors, Bachelors and other higher degrees to help grow WA's share of the international education market and create jobs for Western Australians. These graduates are essential to maintaining the competitiveness of WA's universities, building capacity and strengthening the future workforce. The existing Skilled Migration Occupation List will not be affected. The McGowan Government has also committed $2 million to develop a detailed and comprehensive International Education Strategy, which is expected to be announced later this year. We understand the importance of international students to the culture and economy of Western Australia and we know WA is the perfect location for international students to study and work. The International Education Strategy combined with the new stream for the best and brightest graduates will ensure WA is well placed to grow our international education sector.